With fall coming quick, something attracts me to German wheat beers. Maybe it's memories of the wheat harvest on my grandparents' farm around this time of year. Maybe it's the color schemes on the packaging. Who knows?! What I do know is that I love weissbeirs. 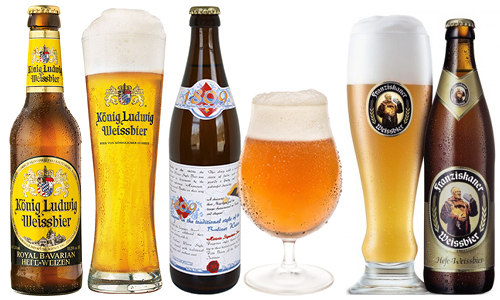 This is a list of German weissbeirs that I tend to gravitate towards this time of year. A royal beer from the kingdom of Bavaria, this is an awesome beer. On the nose, you get hints of banana and wheat; the palate follows with the addition of very strong notes of clove. This is a shining example of the style and very reasonably priced for such a great import. Now, this one is not a traditional weissbier, in the sense that it is not a plain (for lack of a better term) weissbier, but a tart beer. This is a perfect, traditional, Berliner weisse. This beer is very reminiscent of Champagne, very effervescent, and has the same tartness that comes along with that. Don't be intimidated by the terminology if you haven't tried this style before--this is a very easy drinking, accessible beer. This beer is another staple wheat beer from Germany. If you've been to Germany, you've more than likely had Franziskaner. On the nose, citrus and wheat are very prevalent. Wheat and orange follow on the palate. This is one of the first German beers I tried and I was hooked! This will be a mainstay in my fridge this fall. I can see myself with one of these beers, on the porch with the brisk autumn wind blowing through the orange and yellow leaves. If you're looking for something new to enjoy this fall, I recommend trying one of these. As always, you can follow us on UNTAPPD at Colonial Wine & Spirits to see what we have to offer and my personal UNTAPPD (jliddy09) to see what beers I've been trying lately.